JoystickMouseTool allowing the mouse cursor to be controlled by a joystick. It emulates the three standard mouse buttons, extra mouse buttons, a mouse wheel and supports both relative and absolute positioning modes. The tool supports all programs using the standard windows functions for mouse input. It does not work with programs retrieving mouse data at a lower level. The tool switches to idle state automatically if the joystick is not connected or switched off. A left click on the icon will open the setup dialog, a double click will close it. Moving speed can be adjusted via trackbar. Deadzone setting allows adjusting the range of the center position according to the joystick precision. The displayed configuration takes effect immediately. So there is no need to close the configuration dialog for testing it. Relative mode can be combined with other pointing devices like the mouse itself, absolute mode cannot. A well-calibrated joystick using the control panel is heavily recommended, especially if a simple analogue gameport joystick is used. If you cannot reach all corners in absolute mode recalibrate the joystick using the control panel while always keeping some distance from maximum elongation during calibration. The configuration dialog also supports the Tab, cursor- and enter on the keyboard. Mouse wheel emulation might not always work with older, unupdated versions of Windows. This also applies to the extra mouse buttons. Starting with Windows 2000/XP, two of them are defined. Mouse, Mouse wheel and extra button emulation can be used independently. 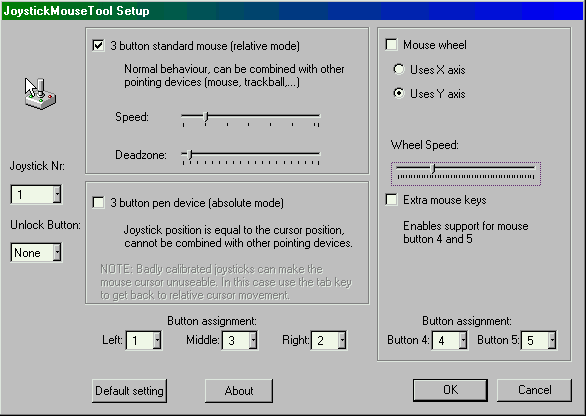 Thus, its also possible to use the tool just for emulating a mouse wheel without emulating the rest of the mouse.